Meghan Trainor made her way to the red carpet yesterday evening(June 22nd) for the 2018 Radio Disney Music Awards at the Loews Hollywood Hotel in LA. 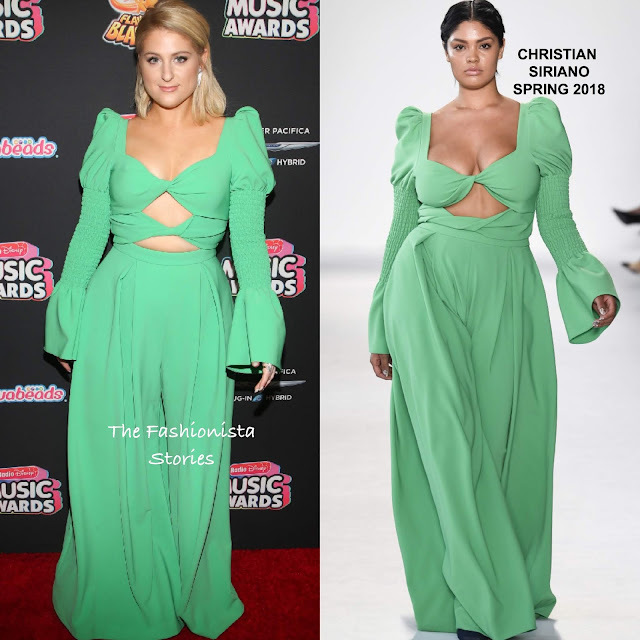 Working a fashionably, on trend look, she wore a green CHRISTIAN SIRIANO SPRING 2018 jumpsuit which featured long puffy sleeves with bell cuffs, a cutout bodice and wide-leg trousers. While the pants could have been hemmed about an inch & the color too much for her, I like that Meghan is stepping outside of the box and doing something different. DJULA jewelry and off-the-shoulder tresses finished up her look. What do you think of Meghan's look?